Let’s say you are a typical busy revenue manager. Your strategy is simple - to fill your hotel. In order to do so, you’ll start with a price that makes sense to you based on your experience, or what you see on some rate shoppers. As the reservation night approaches, if you are not filling up you start lowering your price so that you don’t waste your inventory. You end up filling your hotel most nights, but your revenue is not that great, your RevPAR is actually lower than for similar hotels around you. Now, let’s say you’re a little bit more sophisticated. Your experience tells you that your RevPAR will suffer if you try to fill all rooms on certain nights. So you try to hit last year’s occupancy. In fact, you may look at how many bookings you got in the 10 days before the reservation night last year and add it to what you have on the books for your rooms in 10 days. If that’s below last year’s occupancy, you will probably choose to lower your price by some amount, otherwise you will raise it. Both these types of revenue managers are engaging in the much talked about activity of forecasting. The first revenue manager forecasts that at a certain price he will hit 100% occupancy by the end of the booking period. The second revenue manager forecasts that she will maximize RevPAR if she hits last year’s occupancy, and also forecasts how many bookings she will get in the next 10 days at a specific price. But the first revenue manager misses that he is not trying to maximize occupancy, but revenue. If he has 100 rooms that he sells at €100, his current occupancy is 50% and the occupancy forecast is 98%, he could keep the price and make €9,800, or he could lower the price to €95, sell out and still make less: €9,750. The second understands that maximizing revenue is different from maximizing occupancy, but somehow believes that her occupancy target should be the same as last year’s and that her pick-up in the last 10 days will also be the same. In the example above, she might think that she needs a 95% occupancy, and therefore should increase room prices to €110. Indeed, she might be right and make €9,950 for this room night, but what if she sold the room for €105? Or €115? 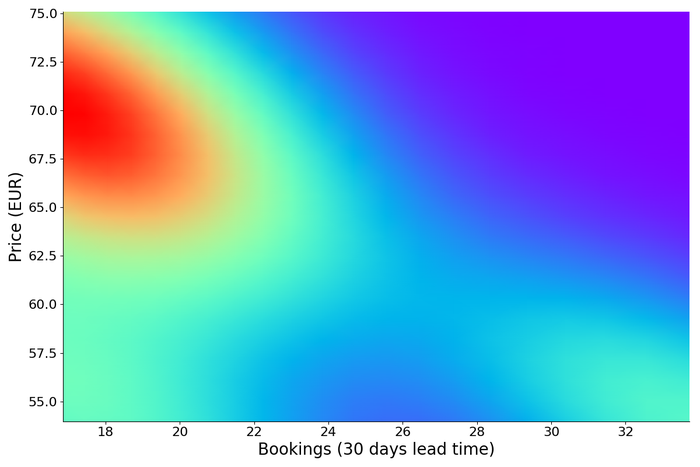 Below, you can see a distribution of how many bookings we expect as a function of price for a sample property with a 30-day lead time. If our second revenue manager above has analyzed these data, now she can forecast her occupancy not at the new price, but a whole range of new prices and set the one that maximizes her revenue. OK, that was a lot harder, but with this strategy as a revenue manager you might be feeling a lot better about your methodology. Is that all? Unfortunately not. If you think that you are going to change your prices as you get closer to the booking date, you need to calculate revenue assuming that those changes will happen! You can see revenue forecasting is actually quite hard, and so is occupancy forecasting, since they are interlinked (when you change prices your occupancy forecast will change). As an experienced revenue manager you might have developed some heuristics to make sure that you are not leaving too much money on the table, but you are probably still leaving money on the table, since these calculations are impossible to make by any human being, particularly as bookings arrive. The real-time engine we have built does exactly this - forecasting occupancy and revenue based on our current bookings, the history and our expectations of how you should change prices. We also understand how much each change in price will affect your total number of bookings, based on your historical track record and what we have been observing for each room and night recently. We will discuss these more in the future, but for now: occupancy forecast, revenue forecast and pricing recommendations are strongly linked and you perform them every time you change a price. While one cannot perfectly predict the future, the better you are at it, the more money you can make from your property.